The private operators of the publicly owned Cairngorm ski area near Aviemore in Scotland have gone in to administration today, but the centre's owners, who have recently invested £1m in a new snowmaking system, say it will operator this winter anyway. CairnGorm has had a string of operational difficulties and was increasingly unpopular with snowsports fans in Scotland, a sizable number of whom had already been looking at a community take over of the area from operators Cairngorm Mountain Limited (CML). Earlier this autumn it was announced that engineers had found unspecified issues with the centre's funicular railway, it's main asset and route to the top of the slopes. The lift is current on an indefinite shut down whilst a more detail study and report is prepared, currently expected in mid-December. It is this latest problem that CML are saying is the reason for them going in to administration. Cairngorm Mountain Limited employs around 70 staff and had a turnover of £3.5m to 31st December 2017 with the Cairngorm Funicular Railway carrying around 300,000 tourists and snowsports fans every year. Administrator Blair Milne, Business Recovery Partner with Campbell Dallas said: "Due to the extended closure of the Funicular Railway at Cairngorm Mountain, for safety reasons, the business has become unsustainably loss-making. The Directors of the business had been in discussions to try to find suitable solutions, including a managed transfer of the business to another party, however those negotiations did not progress. Under mounting cash flow and creditor pressures the Directors were left with no alternative other than to place the business into administration. The joint administrators will be seeking to achieve a sale of the remaining business on a going concern basis as early as possible." The centre is actually owned by public body Highlands and Islands Enterprise (HIE) who also operated prior to appointing CairnGorm Mountain Limited to run the centre in 2014. HIE have committed to keeping CairnGorm operating and last month announced £1m worth of snowmaking equipment including an all-weather TechnoAlpin snowmaking system had been ordered. This is believed to have arrived at the centre in the past few days. "The directors' decision to put CairnGorm Mountain Ltd (CML) into administration is an outcome that HIE had anticipated, and we are well prepared," said Charlotte Wright, chief executive of HIE, adding, "Our first priority is staff members and their families, as well as other local people who will be affected by this decision. We are already in direct contact with the administrator, and confident that Cairngorm will remain open for business." "Clearly, this is not the outcome that anyone wanted when CML became the operator. However, with local support, we are confident that the situation can be turned around and we will see Cairngorm flourish again as a fantastic asset for this area, its economy and its people, continued Charlotte Wright. How can they possibly open? The lifts have fallen into disrepair, the funicular(The biggest mistake they ever made)inoperable, and the infrastructure devastated. These people have deliberately run down Cairngorm and now take the cowards way out. And I bet those snow-making machines have not been paid for either. Good luck recouping that money. "Better to remain reticent and have people think one is an idiot, than to open ones mouth and remove all doubt"
Brucie wrote: How can they possibly open? The lifts have fallen into disrepair, the funicular(The biggest mistake they ever made)inoperable, and the infrastructure devastated. Perhaps you are missing an opportunity here Brucie. Open a stand at the bottom of the hill selling skins, you could make a fortune! I was driven away from Cairngorm many years ago, never to return Far Queue. But if anyone else wants to take you up on your suggestion, fire away. 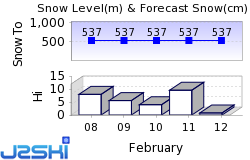 Perhaps Cairngorm will see some skiers this season after all! As I have been saying for years. An utter shambles! Where is there snow in Scotland?